Astros SS Carlos Correa singled into right-center gap against Justin Grimm to bring home George Springer (pictured). 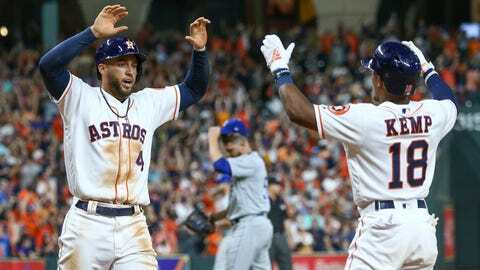 HOUSTON — Houston’s deep lineup can create all sorts of problems for its opponents. “Everybody up and down the staff, we know that our job is to get outs no matter what time of the game it is called upon us to do it,” McHugh said. “He’s going to do that 99 times out of 100. He did exactly what I thought he would.” — McHugh on Correa’s game-ending hit.